European city streets 'have become hunting grounds for Jews,' new report finds. Explosion of violent incidents of Jew hatred exposed. A new study released its findings on Wednesday, exposing how acts of violent anti-Semitism in Europe positively skyrocketed in 2014. "Some are choosing to leave the continent, many are afraid to walk the streets and even more are retreating behind high walls and barbed wire. This has become the new reality of Jewish life in Europe," said Kantor. 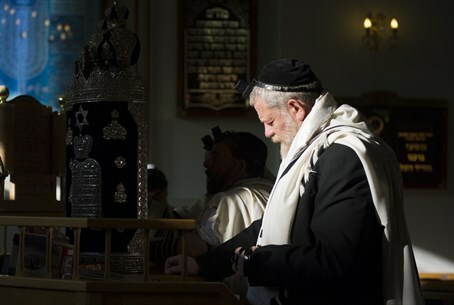 Breaking down the incidents, the report found attacks against Jews and their institutions made up a total of 68 reported cases, more than double the number in 2013. In addition there were 101 cases of direct violence without weapons. The number of Jews violently assaulted included over 306 people, a 66% rise in comparison to 2013. Arson cases more than tripled between 2013 and 2014, and there were a full 412 incidents of vandalism last year as well. There were 114 attacks on synagogues, marking a 70% increase, 57 attacks on community centers and schools, 118 on cemeteries and memorial sites, and 171 attacks against Jewish private properties. Germany likewise ranked highly with 76 incidents compared to just 36 the year before; Sweden made a shocking jump from a mere 3 incidents to 17, Belgium went from 11 to 30, Italy boosted from 12 to 23, and Austria rose from 4 to 9. The report also included in its scope Australia, which went from 11 to 30, and South Africa, which had only one incident in 2013 but 14 in 2014. "The fight must be taken to the attackers instead of allowing it to affect the everyday lives of the victims. We need to move from defense to offense,” said Kantor, calling for harsher measures to defend Jewish lives. EJC delegations led by Kantor have been meeting with EU First Vice President Frans Timmermans and EU High Commissioner for security and Foreign affairs Federica Mogherini in recent weeks, asking for a special EU Envoy and Task Force to combat the rising wave of anti-Semitism. In America, Congress just last month launched its own Bipartisan Taskforce for Combating Anti-Semitism to address rising anti-Semitism in the US. "We need a pan-EU body that will coordinate intelligence efforts between member state and the sharing of such information, assist with legislation changes to enable the member states to address this challenge with proper tools and deal with training and security measures in the protection of Jewish institutions by the authorities.” Kantor said. He concluded, "the current system is failing to deal with this problem or to prevent the next attack."